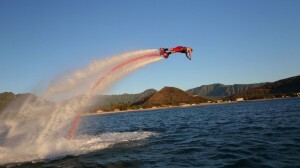 It’s called “flyboarding” and if this looks addicting, looks are not deceiving you one bit…it’s a whole lot of fun. The Jorgenson siblings all took a shot at this new sport on the Jordanelle Reservoir the other day, with some spectacular results. Dustin, Kyle, Lance and some of their spouses took time out from running all the divisions of Jorgenson Industrial Companies to let off some steam and have some good old fashioned family fun. Flyboarding is the ultimate thrill of a lifetime that was only imaginable several years ago until some fiend, somewhere attached some tubes to their watercraft and this sport was suddenly born. The Flyboard is a new, revolutionary and very fun watersports apparatus which allows propulsion into the air, and yes, even underwater as long as you can hold your breath. Imagine it being like a powered wakeboard that doesn’t need to follow a boat! 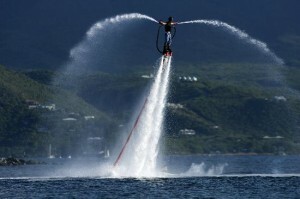 Once people get on the Flyboard, it is all about balance and how to use some of those lesser known muscles in your feet. The nozzles under your feet put out 90 percent of the propulsion and thrust and this allows movement by tilting your feet and tilting the Flyboard in the direction you wish to go. The nozzles on the hands put out 10 percent of the propulsion and are used to help stabilization much the same way as ski poles. What powers the board is the nearby personal watercraft which has an adapter and an intake to force water through the tubes and up into, and out of, the Flyboard itself. It does take some time to learn how to Flyboard, but the intuitive nature of this cool sport makes it easy for anyone to take up and begin—all you have to do is find someone with the set up, which are popping up more and more across the country at reservoirs, lakes and oceans.